Vicon's top-of-the-line mower conditioner triple combination offers 9m working width. 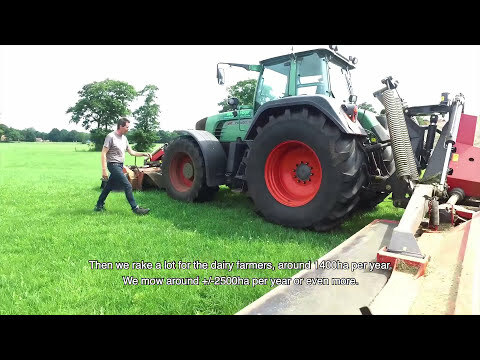 It consists of an EXTRA 632FT or 635FT front mounted mower conditioner with 3.18/3.50m working width and two rear-mounted 3.18m mower conditioner units. There is no need for a special reverse drive tractor, as the EXTRA 690T fits perfectly on a normal tractor with front and rear linkage. The EXTRA 690T is fitted with a balancing weight arm, linked to the 4 heavy duty ground pressure springs on top of the three point suspension, to ensure an even weight distribution of the two rear sections. Vicon EXTRA 690T is the most flexible mower conditioner solution on the market. It can be equipped with wide spreading equipment and the Vicon swath belt solution to ensure outstanding flexibility. It is easy to change between the different configurations, and conversion is very quick. Vicon EXTRA 690T can be set for 3 single swaths, wide spreading or three swaths into one with the Vicon swath belt. An extra feature is the fact that the right belt can run in two directions, meaning that the EXTRA 690T will place grass from 6m into one swath. Vicon EXTRA 690T can be set for 3 single swaths, wide spreading or three swaths into one with the Vicon swath belt. An extra feature is the fact that the right belt can run in two directions, meaning that the EXTRA 690T will place grass from 6m into one swath. When not in use the optional swath belt is raised hydraulically to a position above the mowing units. All you need to do is to push the button on the control box to change the configurations. The swath belts are floating on two large springs, and thus performing a unique and even swath formation under all conditions (no jumping up and down of belt units). A unique and simple solution with several advantages. Vicon EXTRA 690T goes ISOBUS with its New Control System. The swath belt version is now available with ISOBUS control. There is no need for a separate terminal when operating with the EXTRA 690T's 9m working width, steel tine conditioner and the versatile swath belt. All main functions of EXTRA 690T can be transferred to the new Kverneland Group Joystick. This makes operation swift while securing accessibility and support.